And he calls this video a “reality check”!? “I’m here to crap on your dreams”, Tony Northrup begins, before flogging us a Sony camera. Always good to start a review in an unbiased way! In the first minute of the video, he has a go at the pricing. 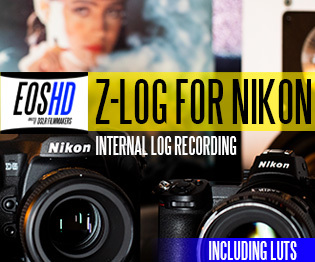 “$500 more than an A7 III!”. For that measly $500, you’re getting 10bit internal, 5.7m dot EVF, 4K/60p, better colour science, better ergonomics and better menus. 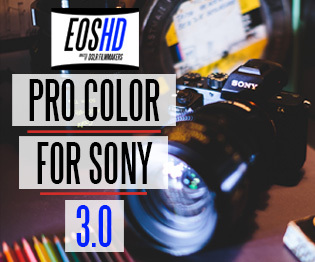 That’s before we dive into the extended feature-set over the A7 III which has a lot of things which simply aren’t in any Sony at the moment like an XQD card slot, anamorphic shooting aspect ratios in 6K photo mode and 180fps 1080p. So Tony is suggesting in the first 2 minutes of the video that 10bit, anamorphic, 4K 60p and 180fps slow-mo aren’t worth a $500 premium, let alone the 5.7m dot EVF? Add to that the better handling and better menus which impact your experience of the camera every time you pick it up. Dispelling the myths by spinning new myths! A new tactic has been employed in clickbait kingdom – the dispelling the hype tactic – to win back credibility after months of Sony PR shin-diggery. I’ve no problem with dispelling marketing hype but dispelling it with your own commercially driven myths is a bit rich. 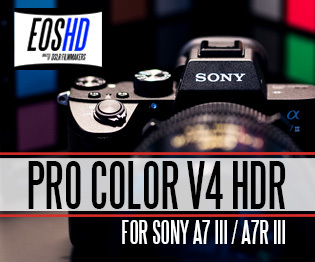 The whole premise of the video-section seems to focus on the 1.5x crop 4K/60p mode as a disadvantage and the 2x crop GH5 as a superior camera for 4K/60p. 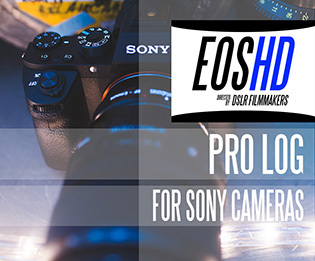 The full frame 4K/24p barely gets a mention. For me along with most filmmakers 4K/24p is the most important mode and we’ll occasionally dip into 4K/60p as a nice-to-have bonus mode for mild-slow-mo. Better and more creative slow-mo can be had in the 120fps and 180fps modes at 1080p. Tony is infamous for causing 35mm lens equivalency confusion but he takes it to new heights with the 1.5x crop criticism. Panasonic only have F4 zooms for the camera so you are better off putting a Sigma 18-35mm F1.8 on a Speed Booster and sticking with a GH5. No mention of putting the Sigma 18-35mm F1.8 on the Panasonic S1, even though it’s designed for Super 35mm, the very crop factor Tony slates the 4K/60p mode for! No mention of the 50mm F1.4 fast prime Panasonic announced with the camera, either. There are already active L-mount to EF mount adapters and Sigma is working on an MCE EF mount adapter for L mount as well. As you can see above, we get this strange denigration of the 4K/60p mode as if you’re stuck shooting F6 equivalent vs the GH5 at F2.3. Multiplying the aperture by the crop factor may tell you how shallow the DOF is but it doesn’t tell you much else about the look of the lens anyway… I have a Kern-Switar 26mm F1.1 c-mount lens that in theory has the DOF of an 52mm F2.4 full frame lens on a 2x crop sensor (GH5) but it looks like nothing else – least of all a full frame 50mm F2. The rendering and bokeh is completely different and it has a vintage Super 16mm look, not a full frame look. So it’s clear that basic maths can’t tell us much about the real image. Tony is getting the 23-45mm F2.3 “full frame” look on the GH5 by putting the Sigma 18-35mm F1.8 on a Speed Booster adapter. The Metabones Speed Booster is a superb piece of kit, a must-have tool and there will be one for L mount as well. Caldwell’s optics are the stuff of a high-end Hollywood optics designer, nevertheless, it cannot work miracles at the edges of the frame. If you’re shooting a landscape at infinity focus it is hard to get the edges of the frame acceptably sharp wide open on a Speed Booster, especially with wider fast aperture lenses like the 18-35mm. 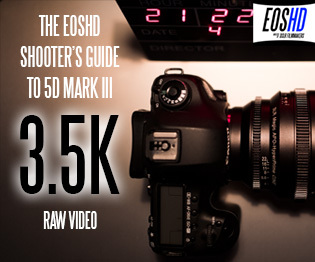 That same lens on the S1 in 4K/60p will be edge to edge sharp in all shooting situations. So we get a 28-52mm F2.7 equivalent on a 1.5x crop 4K/60p mode with this lens, with sharp edges. I am not seeing that on Tony’s Powerpoint slide. Too balanced and not shock & awe enough to generate the da clicks? The 24-105mm F4 lens he claims is a 36-157mm F6 on the S1, is indeed a 24-105mm in 4K at 24p, something else which is left to the viewer’s imagination! The S1 is not a crop-only 4K camera like the EOS R, 1D X Mark II, Fuji X-T3 or Sony A6500. It is FULL FRAME 4K. In my opinion, Panasonic are the company with the highest number of real-photo and video enthusiasts in their ranks at home in Osaka. Even their current imaging boss started out as a keen enthusiast photographer. It also helps that Panasonic have been making cameras I have always bought by choice to use in my filmmaking endeavours – not because they are foisted on me but because they are GOOD. Panasonic recognise our community, which is mostly an enthusiast video community. They have recognised the reach and audience size of EOSHD – YOU have the real influence, rather than any z-list Internet personality – thus they have been listening to your feedback for years and it’s not a small audience, either. Predictably I’ll be attacked by Tony and his apologists so I better defend myself. 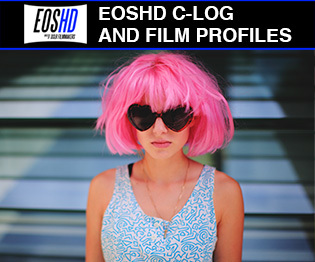 EOSHD has on average 250,000 people every month coming to it and I really do think there are far more engaged camera enthusiasts here there are in the ranks of 100,000 followers on a fashionable Instagram influencer’s account – half of them fake and the other half only there to look at wedding dresses. 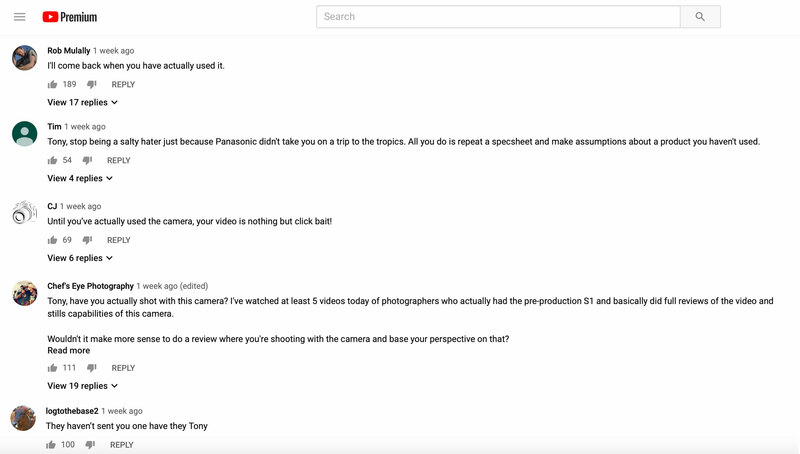 Camera companies are determined to reach out to people like Tony but they must realise that the numbers don’t tell them anything about who his audience actually is and how interested they are in a $2000 camera. So many of these “influencers” have enormous celebrity egos even though they are strictly Z-list and unrecognisable the vast majority of the general public. It is time for some humble pie and for them to go back to school and educate themselves on the technical and artistic side of the craft of photography and video. Isn’t it also time for them to stop selling their influence and opinions to the highest bidder, their brand loyalty determined by the number of PR event invites they get rather than the number of lenses they own. What happened to buying a camera with one’s own money? Shooting beautiful stuff with it? Offering free and honest opinions of it as an artist’s tool? The problem is that this is hard. Instead we have these growing numbers of “influencers” on social media with a large following of fake users to inflate their follower numbers just like they inflate their own egos, spinning all sorts of myths and hype. At the end of 9 years of writing EOSHD I have both friends and non-friends in the camera world. I can tell by now who the people are I don’t share the same values… There are those who I know read EOSHD and have reached out and there are those like Tony who haven’t, because they’re not a true enthusiast or filmmaker. All in all, what these videos amount to nothing but pure self-promotion.